"We'll bleed for the next ten years"
Brutal, systematic and relentless. This is how former Mayor of Belfast, Sinn Féin's Alex Maskey, describes the ongoing Israeli offensive against the Palestinian people. The South Belfast MLA has just returned from a week-long visit to the country, where he attended a conference organised by non-governmental organisation, Passia, based in Ramallah and Jerusalem. The group brings people from around the world to Palestine to tell them about the current situation. Palestinian public officials, academics and international envoys talk to the visitors and also listen to the experiences of people from similar situations. The conference on Ireland and Palestine was also attended by several Irish historians and academics. "What we learned while we were over there was shocking," Maskey told An Phoblacht on Tuesday. "One Palestinian academic said to me "We'll bleed for the next ten years." The offensive against the Palestinians is brutal, systematic and relentless. The Israelis are telling the world that they are doing these things for their own security. But their response to anything that happens is completely disproportionate. There were two Jewish kids killed a couple of weeks ago, which was terrible, but how many Palestinians died as a result of that? 130. There's no justification for their actions." 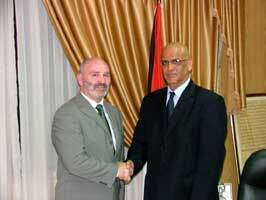 During the visit, Maskey met with Palestinian chief negotiator Saeb Erekhat. He had also been scheduled to meet with Palestinian leader Yasser Arafat but this had to be cancelled due to a state of emergency..
" Saeb Erekhat made me realise that this is a chronic situation," Maskey said. "The people I have been speaking to are bordering on despair, and they seem to have no idea about how to move forward. The Israelis are brutalising the whole population, bulldozing all around them and leaving the Palestinian people leaderless. They've rendered the Palestinian Authority completely ineffective. They have Arafat trapped in a bunker in Ramallah, he can't get out." Maskey said that members of the Palestinian Authority are now struggling to advocate a two-state solution, with Palestinian and Israeli states co-existing. "The people are saying Israel has no honour and has no intention of conceding a Palestinian state. Now, they don't want to give Israel a state. They believe the possibility of a Palestinian state has been rendered impossible because of the policies currently pursued by the Israeli Government," he said. "They're building this Wall right through the Territories and increasing the number of Israeli settlements. And these settlements are far from makeshift camps. "The Israelis say the camps are unauthorised, but they are supported 100% by the Israeli government. All the roads in and out of the Palestinian villages near these settlements are blocked off and the one access road left open is manned round the clock by the Israeli army. There are dirt-tracks going into a town of several thousand Palestinians and lovely motorways going in to service these allegedly illegal settlements." Maskey said he realised on his trip that there is no way that Israel could sustain the current level of militarisation without outside help. "Anyone I spoke to among the Palestinians, their mood ranges from anger to despair," he said. "There is so much suffering daily and yet the international community has shown itself to be absolutely ineffective. The Palestinians feel that the outside world has no sense of the degree to which they are suffering. There are a number of activists being targeted by the Israeli authorities but in the middle of all this there's a lot of men, women and children being killed." Maskey said that the Palestinian Authority is bitterly disappointed that the international community hasn't stood by the Road Map peace plan. "There are individual countries doing good work in Palestine, but physical work, like construction, is often destroyed by the Israeli military and bureaucracy holds the rest of it up," he said. "In terms of the Road Map, there were four main bodies that were meant to be established to deal with refugees, humanitarian aid and so on. 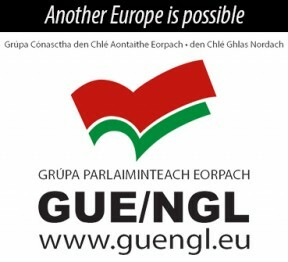 The EU was to oversee one, the UN another, and the US two. But none of them have been set up." Recently the UNRA, which deals with refugees, was forced to cease its work in the Territories. "The Israeli government was forcing them to use this very dangerous road and it just wasn't possible for them to continue their work," Maskey said. "And their office in Jerusalem, where they have 200 staff, that Wall that's going up at the moment means that 180 of them won't be able to use it. "I was shocked, even coming with an understanding of Palestine and the problems. It's only when you're there that you see the full intensity of it. You're angry yourself. The Israeli government doesn't recognise Palestine as a state, they don't even recognise the Territories as being Palestinian. The possibility of a two-state solution seems as remote as ever now." Maskey and Sinn Féin TD Aengus Ó Snodaigh met with 26-County Government officials on Tuesday to relay what the Belfast MLA learned on his trip and to discuss what the Dublin Government is doing to help the situation in Palestine. Maskey urged incoming Foreign Affairs Minister Dermot Ahern to make the issue of the Middle East a policy priority. "We reiterate our call for the international community, under the direction of the UN, to act immediately to ease the sense of despair felt in Palestine," he said. "An initiative is required to place pressure upon the Israeli Government to remove its troops and illegal settlements from Palestinian lands. I am also calling upon the EU to support the suspension of preferential trade with Israel."